Transit-board members voted unanimously Thursday to establish a $3.2 billion budget and a tentative opening date of July 17, 2024. CEO Peter Rogoff mentioned that possibility at a transit-board meeting Thursday. If the grant isn’t nailed down by summer, he cautioned, the agency will face tough decisions and financial risks this fall. The 8-mile route along Interstate 5 was approved by regional voters in 2008 and would add an estimated 68,500 daily passengers to the light-rail network. Transit-board members voted unanimously Thursday to establish a $2.77 billion project budget and a tentative opening date of July 17, 2024. This figure doesn’t include the cost of 34 new railcars, plus $155 million in debt-finance costs paid out before opening day, which raise the grand total to $3.2 billion in Lynnwood Link’s application to the Federal Transit Administration (FTA). Sound Transit staff included eight months of time cushion in case of minor setbacks, and say the odds of opening on time are 80 percent. The FTA’s $3.2 billion exceeds last year’s published estimate of $2.9 billion, mainly because this spring the feds demanded $170 million in extra contingencies. The FTA’s risk reviewer found that given “the volatile nature of the market,” Sound Transit wasn’t setting aside enough cash. 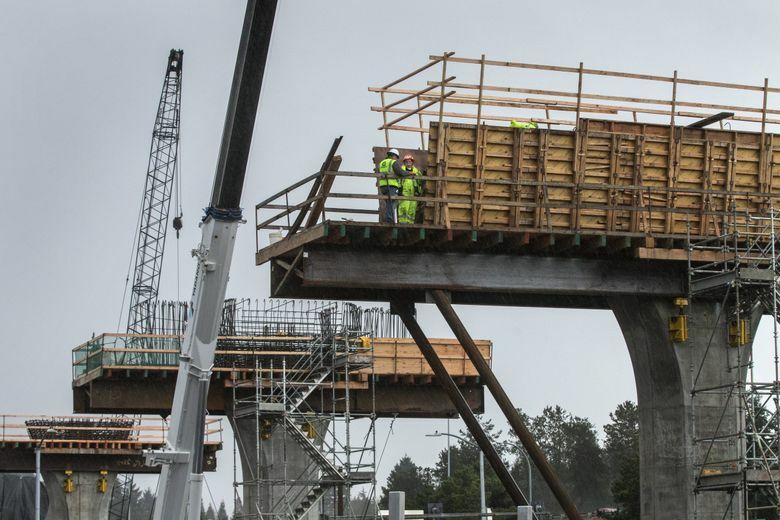 Last summer, the agency disclosed that costs were boosting an original $2.4 billion estimate by $517 million, due to a hot economy, growing land demands by Sound Transit, and design features suburban cities sought. Since then, about $200 million was peeled back though engineering changes, corridor director Rod Kempkes said. If successful, those trims may reduce the current $3.2 billion total. 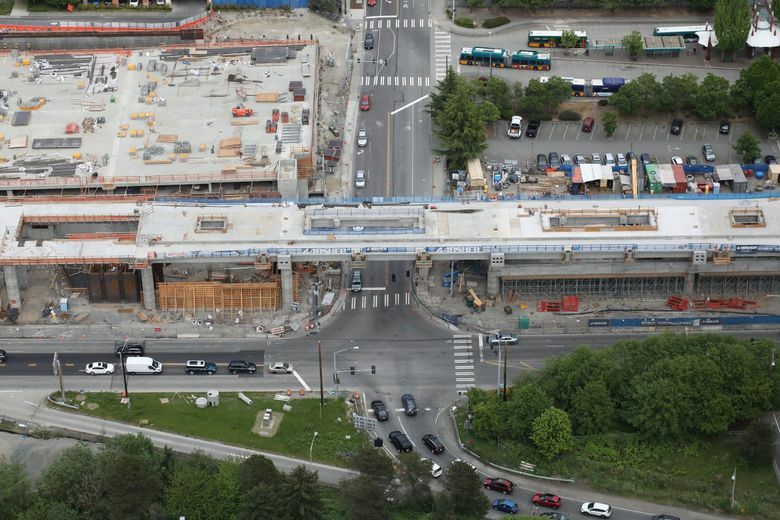 The biggest savings is moving a park-and-ride garage at Shoreline North/185th Station to the east side of the freeway. That would save $15 million in land costs and pedestrian walkway improvements. For a time, the FTA money was in greater jeopardy, because the Trump administration proposed scrapping federal aid to transit megaprojects, on grounds that transit is a local matter. But both houses of Congress voted to preserve FTA grants, keeping Lynnwood Link in the pipeline. But the award was delayed and is still unsigned. If federal money is withheld for political or other reasons, after construction begins, local politicians face hard trade-offs. Sound Transit could finance the entire $3.2 billion, plunging its three-county region into further debt, which might crimp cash flow to build other transit on schedule. But pausing the project might trigger cancellation payments to contractors, leave station properties idle, or waste money spent for early demolition of downtown Lynnwood buildings. Fellow board member Claudia Balducci, a Metropolitan King County Council member from Bellevue, said that dithering now might hurt Sound Transit’s credibility in locking down a federal grant deal. “My analogy is more like a chicken and an egg,” she said.